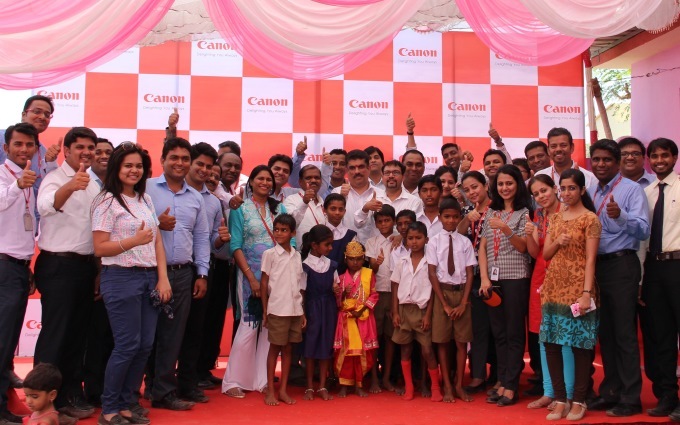 Canon India recently celebrated the first anniversary of its village adoption initiative. As part of its Corporate Social Responsibility (CSR), Canon India has adopted the Karanjoti Village at Thane district in Mumbai, Maharashtra. This is yet another milestone in Canon India’s flagship programme ‘Adopt a Village’. Prior to this, Canon India has adopted 4 villages in the country which are Ferozepur Namak in Haryana, Maharaja Katte in Bangalore, Karanjoti in Maharashtra and Sol Gohalia in Kolkata. The villages are being supported with better education facilities, sustainable environment, health and hygiene along with complete eye care facilities. Nearly a year back, Canon India had adopted Karanjoti village to redefine the lives of people in and around the village by providing them with facilities for a well-developed and sustainable living. Karanjoti village has seen numerous noteworthy developments, since its adoption by Canon India. To mention a few, capacity building in the school has led to students returning to the village school. The school now has better classroom infrastructure, clean drinking water supply, a resource centre with a non-formal education teacher to impart computer literacy, art and craft skills and encouraging sports among the students of all grades along with a vision centre for better eye care services. Canon India marked one year of adoption of the Karanjoti village by taking over 40 employees to this village to celebrate this day with their Karanjoti family. School children brimming with vigour gave a warm welcome to the employees with regional dance performances. A carom and quiz competition was organised, where the students participated and won accolades and trophies for their performance. There was an exemplary display of experiments such as electromagnet, heat conduction and water purification by the students under the guidance of their teacher in a science exhibition. Ensuring a progressive way forward for the young lives, Canon identified children with refractive errors and provided spectacles, during free eye check-up camp conducted in the school. Speaking about Canon’s efforts in this direction, Mr. Kazutada Kobayashi, President & CEO, Canon India, said, “Adopt a Village initiative is our way to ignite the passion to live a healthy informed life. Our vision of develop the communities around us has brought us a long way. Canon India Pvt. Ltd., a 100% subsidiary of Canon Singapore Pvt. Ltd., is a world leader in imaging technologies. The company has offices and warehouses in 14 cities across India and employs over 1000 people. We hope many such corporate houses take similar initiative and reach out to our villages for common good.